Most brake problems result from excessive friction or poor installation of the cables, not poor setup, or poor quality brakes. Also see the article on cables for information on cable selection and adjustment of brake cables and brake levers. Traditional cantilever brakes used two cables, a main cable running down the centerline of the bike, and a second, "transverse" cable connecting the cantilever units on each side of the wheel. The main cable would pull upward on the middle of the transverse cable, causing the cantilever units to rotate inward. The "direct pull" cantilever, also commonly known under its Shimano trademark name "V-Brake" is a simpler design, using only a single cable. 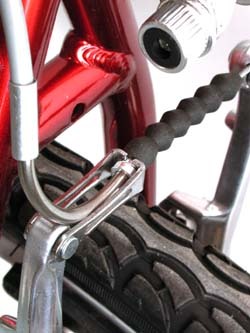 The cable housing connects to one arm, and the inner cable runs across the top of the tire to the opposite arm. When the brake is applied, the housing pushes on one cantilever while the inner cable pulls the other. Since the cable runs straight across the top of the tire, direct pull cantis need longer arms to get the cable high enough to clear the tire. This increases the mechanical advantage of the system, requiring the use of special matching brake levers. Direct-pull brakes also avoid a serious risk. If the main cable of a traditional cantilever brake fails, the transverse cable can snag on a knobby tire and lock the wheel. If the front wheel, the rider will pitch forward. A direct-pull brake only stops working if the cable parts. Your bicycle has two brakes -- right? 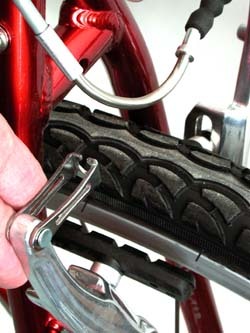 For wheel removal, the noodle may be unhooked from the arm link. This will allow the brake shoes to open up wide enough to clear even a fat tire. First, pull the boot away from the end of the noodle. Then squeeze the brake arms together with one hand while unhooking the lower end of the noodle from the keyhole-shaped slot in the arm link. Make sure to hook the brake back up immediately after you re-install the wheel! Install the arms with them at their maximum spread and tighten the bolts that hold them to the frame. This is how you set the springs. Most direct-pull brakes use smooth-stud type brake shoes, which allow adjustment of extension -- that is, how far the shoe is inboard of the brake arm. The brake shoes need to be extended inward from the brake arms only if the brake arms are too close together at the top, interfering with the tire or allowing too little cable travel. If your brakes use the Parallel-Push linkage, the pivots may need servicing. There used to be special kits for this, but also see the information later in this article.. When the brake is released, the brake shoes retract away from the rim. Ideally, the shoes on both sides should back off by the same amount. If they don't, the brake is not properly centered. In extreme cases, one of the shoes may not retract, and may rub on the rim even when the brake is not being applied. If a brake appears off-center, check first that the wheel is installed straight in the frame/fork. If the wheel is crooked, and you maladjust the brake to compensate, you are creating two problems where there was only one before. If your wheels are centered, and your brakes are not, and, if the pivots are properly lubricated and free-moving, the brake shoes should be centered. If they are not, you probably need to adjust the spring tension on one or both of the cantilevers. Some brake bosses have more than one hole for the end of the spring, to allow a rough adumstment of spring tension. Generally, the hole which provides more tension should be used with a narrower rim. Make sure that both brake arms use matching holes. 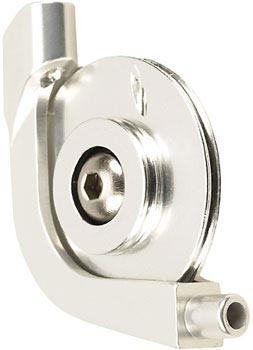 Most direct-pull cantilevers have a fine adjustment for spring tension. 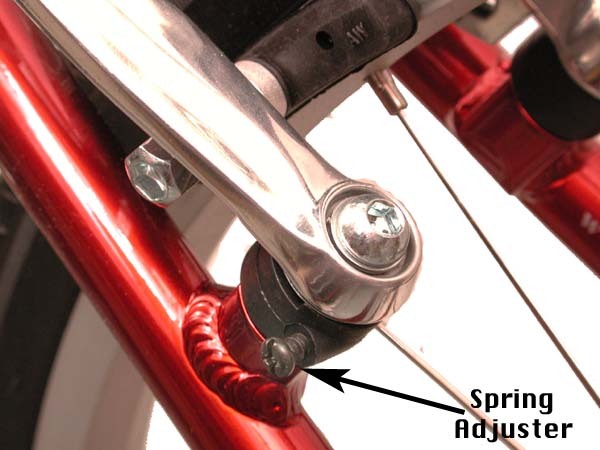 The adjustment will be a small screw with the head facing outward to the side of the bike. The screw is generally located near the bottom of the cantilever, below the pivot point. Sometimes it works with a Phillips screwdriver; other times, a small Allen wrench may be needed. Tightening this screw tightens the spring, so you want to tighten the spring of whichever arm is too close to the rim. This will make it spring back farther. It causes the brake shoes to remain at the same angle to the rim throughout the stroke, and throughout the service life of the pad. It causes the direction of motion of the brake shoes to be close to horizontal, rather than the usual slanted arc centered on the pivot boss. This is a major advantage for those who use very fat tires on narrow rims, because it prevents the shoe from rising up and damaging the sidewall of the tire on release, and also prevents having the brake shoes dive under the rim as they wear down. Unfortunately, the extra pivots considerably complicate the mechanism, and this has caused maintenance problems and excessive squeal in practice. Shimano parallel-push V-brake tune-up kits have all but dried up so I fixed my squealing XT parallel-push V-brakes by adding disc brake rotor washers to tighten up the parallel-push pivot cage. This works the same as the tune-up kit did. Firstly, buy some disk brake rotor spacer/washers from a bike shop and super glue from the local supermarket, hardware store etc.. Remove the brake arms from the bike using a 5mm Allen key. On your workbench, remove the brake pads. Using a utility knife, peel off the silver stickers from the ends of the parallel-push cage pivot. Take a photo of a parallel-push cage to remember the order of existing spacer and spring. Remove the 2mm Allen set screw from each brake arm. You now can push out the parallel-push cage pivot. Give the parts a wipe clean. Now reassemble the brake arms and parallel-push cages including adding one or more rotor spacers between the brake arm and the parallel-push pivot cage to take up most of the slack. You want each pivot cage still to turn freely on its pivot without binding. Replace the 2mm Allen set screw in each brake arm using blue threadlock compound. Degrease the silver main pivot stickers and the ends of the main pivot using solvent and a cotton swab (Q-Tip). Clean the brake pads with using solvent and sandpaper and then reattach. Clean the wheel rims using solvent and sandpaper/fine steel wool. Reattach the silver main pivot stickers using a small amount of super glue around their perimeter. When glue has set (10 or 20 seconds) reattach the brake arms to your bike, remembering to use blue threadlock compound on the main pivot bolts. You have now removed the slack that causes severe squealing. Direct-pull cantilevers have double the mechanical advantage compared with traditional brakes, so they require special brake levers. Direct-pull brake levers pull the cable twice as far, half as hard. The lower mechanical advantage of the lever compensates for the higher mechanical advantage of the brake arms. It is not generally safe to mix and match levers/cables between direct-pull and other types for this reason. Direct-pull brake levers used with any other type of brakes will feel nice and solid when you squeeze them, but due to their lower mechanical advantage you'll need to squeeze twice as hard to stop as you should, so unless you are a lightweight rider with gorilla-like paws, this combination isn't safe either. To make a brake lever with low enough mechanical advantage for direct-pull cantilevers, the cable must run twice as far from the lever's pivot point. 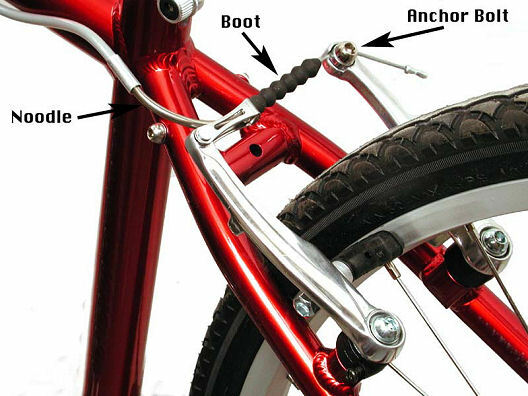 This is easy enough to do with levers for straight/upright handlebars. Levers for drop handlebars are harder to configure for direct-pull brakes, and currently, there are only a couple of drop-bar levers made that are compatible, the. At present (2018) there are several drop-bar brake levers designed to work with direct-pull cantilevers: the Dia Compe 287V, Cane Creek SCR-5V "Æro" levers, Tektro RL520 and perhaps others. Due to the nature of drop-bar levers, it is not so easy to make a suitable lever that can be operated both from the drops and from the hoods. Most newer drop bar bikes are have Ergo or STI brake/shifter units as original equipment. Direct-pull cantis are not compatible with these. Other types of shifters may of course be used, along with the special brake levers. In any case many cyclists prefer bar-end shifters. These are simpler and less expensive than brake-lever shifters, and give an indication of what sprocket is in use: brake-lever shifters return to the same position after every shift. You can use a pulley device, such as the QBP Travel Agent (Q.B.P. Photo). These are a bit of a hassle to set up, but do work. Any pulley of the small diameter commonly used on bicycles eventually leads to fatigue failure of the cable, so check the cable regularly for fraying. 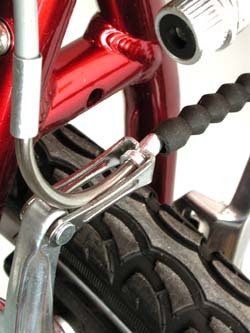 If you have a bike with skinny tires and no fenders, there are "shorty" direct-pull cantis that are more-or-less compatible with drop bar levers. Neither of these systems is ideal, and neither is really any better than traditional center-pull cantilevers. Note the differing levers and pivot stud positions.